Overwatch is the most gender-diverse first-person shooter on the planet, according to research firm QuanticFoundry. In fact, the proportion of its players who are women equals more than double that of the closest FPS. For more like Overwatch, check our list of the best FPS games. Women make up 16% of Overwatch’s playerbase. That’s around five million female players, generating over $250 million in revenue for Blizzard. Why does this out of all the shooters appeal to women the most? Well, it’s mostly down to the setting, the diverse cast, and the powers, according to research scientist Nick Yee. You see, women don’t mind doing a bit of murder, but many find traditional war settings uninspired. They would rather kill you with a rocket barrage from the skies, or crush you with a gorilla. Fair enough, to be honest. “Most shooters don’t have female protagonists, so that’s one [reason],” Nick Yee explains in an interview with New World Notes. Yee also references a QuanticFoundry blog post and its comments on how women would rather kill in creative ways. “Women perceive guns to be unappealing (even though they might not mind violence) because they see guns as the most boring and unimaginative way to kill someone,” Yee says. 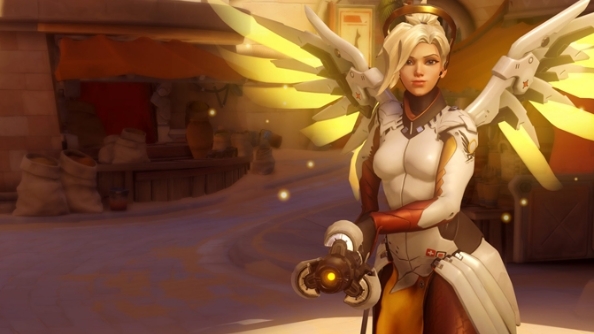 “Overwatch provides more magic/alternative methods of killing people (in addition to guns). So there you have it – women like Overwatch because they have good taste.